Tom and Terri both work early, so I had the house to myself (along with their 3 cats and a dog) to get some work done. Spent the morning uploading videos to the website and reviewing President Obama’s speech announcing his run for president. Then headed into the city to find the Old Capitol building. The plan for the day was to shoot a video for the President, see what kind of media coverage I could generate, and make my way east towards Clinton, IL. Got to the Capitol grounds and found the precise location where the President gave his speech, but the grounds were closed. So filmed the video outside the gate (as best I could, with so many people coming up and asking about the trike), making a heartfelt appeal to the President to follow through on the bold and inspiring proclamations he issued in his announcement speech. In case you’re wondering, that little figure over my right shoulder is a balloon Harley Rider Tom & Terri left on my trike this morning. Later made some media calls. The Illinois Times came out to do an interview and take some shots of the trike. Also did an interview with local ABC New affiliate WICS. By then, it was getting almost too late to ride, so called Terri and asked if she and Tom would mind a house guest for one more night. Not a problem. 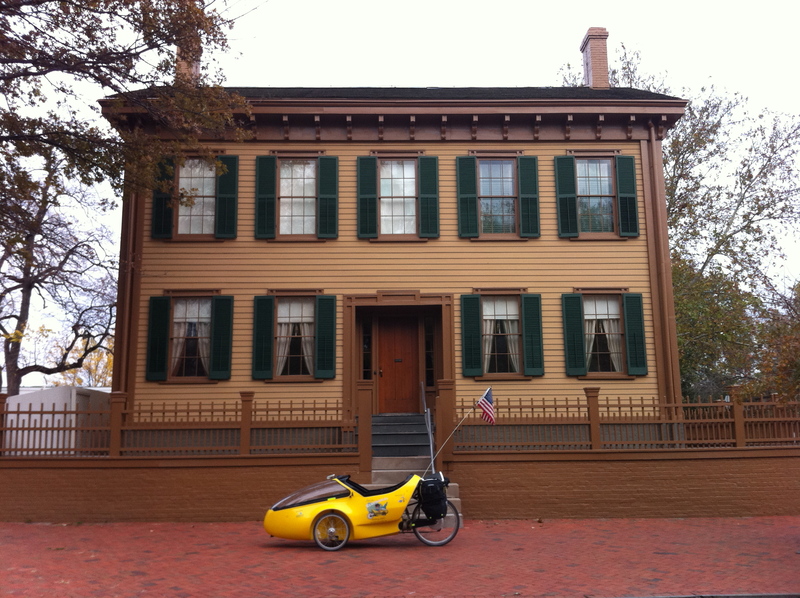 Figured I should see Lincoln’s home, since it was just down the street, so rode over there for a quick walk around. Tarried a little too long, though, as the light was already starting to fade. This meant racing several long miles down city streets as the sky darkened with no back light (it had fallen off as I hurriedly left the house this morning), not totally sure of where I was going and needing to get there fast. Not fun, but I’m thankful for all the drivers who managed to see me and gave me some space on the side of the road. The biggest irony was how happy I was to see those tall smokestacks on the horizon, as it meant I was close to “home.” Was dark when I finally rolled into the driveway, safe and sound. No more night riding, if I can help it. This entry was posted in 2010 Ride, Articles, Blog, Video and tagged illinois times, lincoln home, ride for renewables. Bookmark the permalink. Didn’t know if you’d seen these sites… Should be encouraging. Good Luck! Tom, thanks for all the legwork so far, and hopefully The President will be with you shortly.